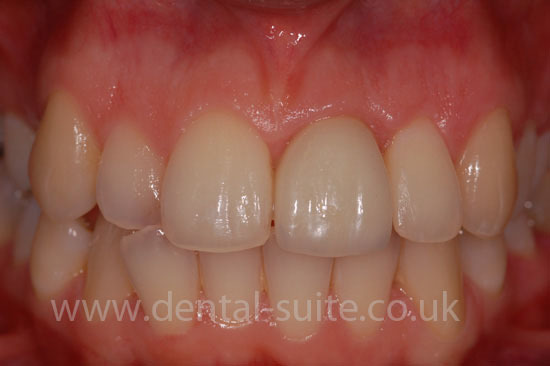 This Leicester patient presented to me unhappy about her crown done at another dental practice. The photos show an unsightly crown on the upper left central tooth. 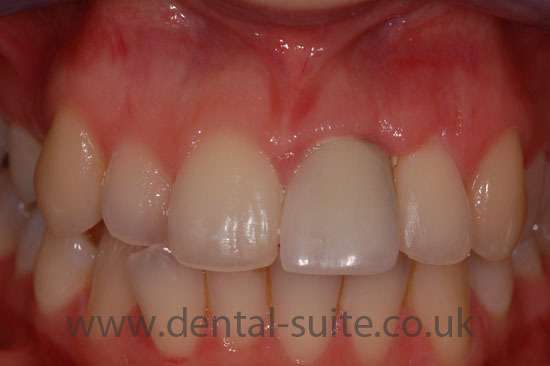 It also shows the inflammation of the gums due to them being poorly contoured and designed. This would have caused extensive damage to the gums and bone if it had been left like this. • Prepare the tooth for a high quality all ceramic crown and then cement this crown 1 week later. The patient was ecstatic with the final result. • Price is important but be aware cheap is not always best. Remember when having cosmetic work you are paying for the skill and experience of the clinician, the artistic ability of the technician and high quality materials. • Ask to see past cases of your dentist and postgraduate qualifications.